After being released, 52-year-old Dinanath Upadhyaya of Jagun in Tinsukia district reached his home on Tuesday. After 17 days of captivity in United Liberation Front of Asom –Independent (ULFA-I), Upadhyaya was traced and recovered by security forces from Lungri Basti along the Assam-Arunachal border near Wara village on the 18th day after his kidnapping. Dinanath Upadhyaya of Udaipur in Jagun, a supervisor at a Phaneng-based private tea garden in Jagun, owned by Radha Chetia, was abducted by a group of five motorcycle-borne armed youths while he was on the way to the local market on June 8, 2018. The victim, who was found in sound health, after reaching his home, said that he was kept in a Myanmar-based ULFA-I with all care. “Thank you ULFA-I and thank you, Paresh Baruah, the ULFA-I C-in-C for the kind treatment besides treating my ailments administering injections,” said Upadhyaya, surrounded by his family members at home, with tearful eyes. “I was abducted suddenly by a group of five armed youths while I was on my way. They who never chastised me but made me walk continuously till we reached the destination in Myanmar” said Upadhyaya. Margherita MLA Bhaskar Sharma and the owner of the tea garden under whom Upadhyaya works as a supervisor, also visited Upadhyaya. Earlier, various organisations and family members of the victim had staged protests demanding safe release of Upadhyaya. The ULFA-I demanded Rs 3.5 crore as ransom for safe release of Upadhyaya. 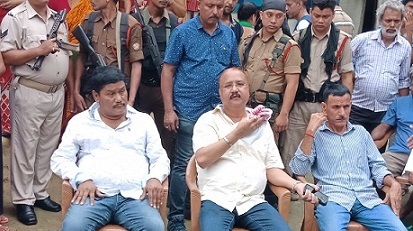 The dramatic release of Upadhyaya along the Assam-Arunachal border at night has been assumed as baffling and not free from apprehension whether or not the release was effected against ransom as sought by the ULFA-I. However, after medical and other official formalities, the rescued victim was handed over to the family members at Udaipur where the relatives and people of the village were already waiting eagerly for Upadhyaya.